Science Fact: A weed in the garden of life. So we might describe an obstacle, a pothole in our personal progress. A previous post talked about “physical activities that require concentration” as a promising way to get great ideas. The garden weed and the activity it inspires can be such a catalyst for an inspirational experience. Nola and I were addressing the weed issue at our Michigan home last week. For my Zen-like activity I chose to weed a plot we had planted with portulaca, also called moss rose and featured at the head of this post. 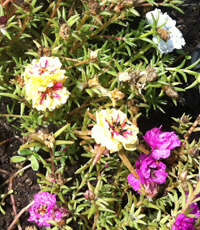 The reverie of weed eradication freed my mind to remember a garden-related experience when I lived in Malibu. In the 70s and 80s I had the privilege of knowing Betty Freeman, a leading California philanthropist and financial supporter of “new music,” by which I mean “classical music” by living composers. Betty would host composers to perform their works in her Beverly Hills home, where fifty or more Los Angelenos would gather for the music and to share a gigantic pot of pasta prepared by Franco Assetto, her husband and an accomplished visual artist. Weed extraction was perhaps not what the proverbialist had in mind, yet there is contentment and opportunity for thought even in this lowly chore. The activity caused me to ponder why weeds grow so successfully when our intended plants struggle to get along. I wondered to myself, why hasn’t some modern Luther Burbank taken crab grass or kudzu and crossed it with lilies or marigolds, producing a space-age mutant superflower that would ruthlessly take over your yard while displaying dazzling flowers? Could it be that a conspiracy was afoot? What if Monsanto suppressed the development of hardier nursery flowers so it could continue to sell Roundup to weed-averse gardeners such as us? What if an evil neighbor scattered weed spores across our yard when we were absent? Worse yet, what if the local garden supply store seeded our entire city with weed seeds dropped from a low-flying aircraft, to boost their business? Regular readers of this blog will be saying, OK, Art, where’s the Science? Simply this: weeds are amazingly successful because they generally don’t waste their time making pretty blossoms; they save that energy and use it to invade your garden. Moreover, some weeds (ruderal species) are specifically adapted to the conditions we provide when we till and amend the soil to prepare a garden for planting; they are species that evolved to colonize areas disturbed by wildfires or avalanches. Thus the mythical superflower will have a great deal of trouble being simultaneously pretty and hardy. – Milkweed: The beautiful monarch butterfly is currently in decline because of eradication of milkweed, on which its larvae depend, as well as loss of winter habitat. Garden-friendly milkweed can be intentionally planted to help support this popular insect. – Dandelion: Besides being edible as salads and being used in herbal preparations, dandelions in the garden improve the soil quality for other plants. – Clover: Weeds often make excellent “companion plants” to protect desired plants. For example, studies of cabbage plants revealed that insects are so stupid that they will lay their eggs on any green surface. Thus when clover is planted alongside cabbage plants, harmful insects most often lay their eggs on the clover, which is not a suitable host for the larvae. It happens that green plastic plants can also play this role of distraction, but clover is preferable for the farmer to use because it multiplies on its own! Therefore, until the superflower is invented, perhaps we should expand our gardens and selectively invite a weed or two to take up residence! Does the weed in your garden cause you distress? Can you include a desired weed here and there to improve the health and beauty of your landscaping? Great minds think alike? One day after this post, a story about weeds appeared in our local Grosse Pointe Times (http://www.candgnews.com/news/plant-choices-provoke-weed-discussion). One of our fellow citizens planted milkweed and bee balm in his yard, “weeds” that are friendly to monarch butterflies and bees, both of which are threatened. A neighbor complained, the City code enforcer visited, and the weed-planter had to defend his floral choices in a City Council meeting. Native and drought-tolerant plants are SOP in the Southwest, but in the Midwest we are still in the process of educating ourselves in this area.